Costume, check. Trick-or-treat bag, check. Comfortable walking shoes, check. Ready for a night full of fun? Double-check! Pack up the kids and come out Halloween night for the 6th Annual Cedar Springs Halloween Spooktacular in Cedar Springs! Sponsored by the Cedar Springs Area Chamber of Commerce, area businesses and churches, the fun starts at 4:30 p.m. with storytime at the library, at the corner of Cherry and Second, followed by trick or treating from 5 to 7 p.m. at Main Street businesses. People can pick up their maps of participating businesses at the library. Trick-or-treating will be from 5 p.m. to 7 p.m. If you are hungry, there will be hot dogs for sale next to the Cedar Pub. The Kent County Sheriff Traffic Squad and Cedar Springs Fire Department will hand out candy, cider and donuts at the firebarn at W. Maple and Second St. from 5:30 to 7:30 p.m. while supplies last. Two area churches will also be part of the festivities. Calvary Assembly of God will host a carnival in the lot by the next to D&J nails. The Springs Church, at the corner of Maple and First, will be hosting Trunk-or-Treat from 6pm-8pm, along with a giant slide, and the Double K Farms petting zoo in their parking lot, and free donuts and hot chocolate inside for trick or treaters and their families. 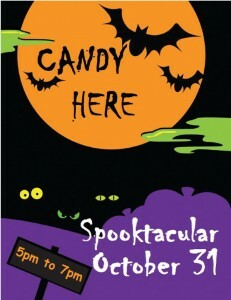 For more info, including details on the costume contest and other Halloween events, click here.